Figure 1.1. (a) Schematic representation of the components of the coupled carbon-climate-human system and the links among them. Solid lines and (+) indicate positive feedbacks, feedbacks that tend to release carbon to the atmosphere and amplify climate change. Dashed lines and (—) indicate negative feedbacks, feedbacks that tend to sequester carbon and suppress climate change. GHG, in the center box, is greenhouse gases. ARD, in the lower right of the land box, is afforestation, reforestation, deforestation, the suite of forestry activities identified as relevant to carbon credits in the Kyoto Protocol. Over the next century, the oceans will continue to operate as a net carbon sink, but the land (in the absence of fossil emissions) may be either a source or sink. (b) Two complementary perspectives on human drivers of carbon emissions. 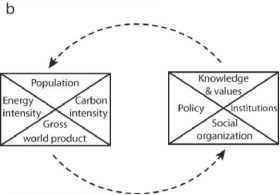 In the Kaya identity widely used for economic analysis (left), emissions are seen as a product of four factors: population, per capita gross world product, the energy intensity of the gross world product, and the carbon intensity of energy production. From a political science perspective (right), the drivers emerge from interactions among policy, institutions, social organization, and knowledge and values. sive. All of the authors worked with the editors and the publisher to produce a finished book within nine months of the synthesis meeting. The book is organized into seven parts. Part I contains the crosscutting chapters, which address the current status of the carbon cycle (Sabine et al., Chapter 2), the future carbon cycle of the oceans and land (Gruber et al., Chapter 3), possible trajectories of carbon emissions from human actions (Edmonds et al., Chapter 4), approaches to reducing emissions or sequestering additional carbon (Caldeira et al., Chapter 5), and the integration of carbon management in the broader framework of human and Earth-system activities (Raupach et al., Chapter 6). Part II surveys the carbon cycle, including historical patterns (Joos and Prentice, Chapter 7), recent spatial and temporal patterns (Heimann et al., Chapter 8), greenhouse gases other than CO2 (Prinn, Chapter 9), two-way interactions between the climate and the carbon cycle (Friedlingstein, Chapter 10), and the socioeconomic trends that drive carbon emissions (Nakicenovic, Chapter 11). 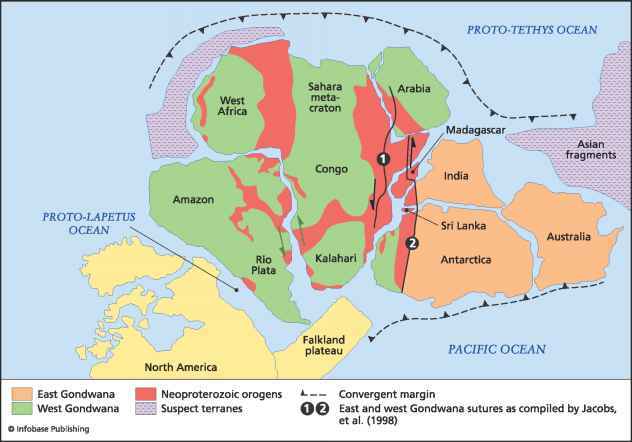 Parts III through VII provide background and a summary of recent findings on the carbon cycle of the oceans (Le Quéré and Metzl, Chapter 12; Greenblatt and Sarmiento, Chapter 13), the land (Foley and Ramankutty, Chapter 14; Baldocchi and Valentini, Chapter 15; Nabuurs, Chapter 16), land-ocean margins (Richey, Chapter 17; Chen, Chapter 18), humans and the carbon cycle (Romero Lankao, Chapter 19; Lebel, Chapter 20; Tschirley and Servin, Chapter 21), and purposeful carbon management (Sathaye, Chapter 22; Edmonds, Chapter 23; Sanz et al., Chapter 24; Manne and Richels, Chapter 25; Bakker, Chapter 26; Brewer, Chapter 27; Smith, Chapter 28; and Robertson, Chapter 29). The key messages from this assessment focus on five main themes that cut across all aspects of the carbon-climate-human system. The overarching theme of the book is that all parts of the carbon cycle are interrelated. Understanding will not be complete, and management will not be successful, without a framework that considers the full set of feedbacks, a set that almost always transcends both human actions and unmanaged systems. This systems perspective presents many challenges, because the interactions among very different components of the carbon cycle tend to be poorly recognized and understood. Still, the field must address these challenges. To do that, we must start with four specific themes that link the ideas discussed throughout the book. These four themes are (1) inertia and the consequence of entrained processes in the carbon, climate, and human systems, (2) unaccounted-for vulnerabilities, especially the prospects for large releases of carbon in a warming climate, (3) gaps between reasonable expectations for future approaches to managing carbon and the requirements for stabilizing atmospheric CO2, and (4) the need for a common framework for assessing natural and managed aspects of the carbon cycle. Each of these themes is previewed here and discussed extensively in the following chapters.